The Dakhla Oasis lies to the northwest of Kharga and is also about 310 km to the southeast of Farafra. This oasis consists of 14 settlements and has a population of about 70,000 people. Dakhla is the farthest oasis out of Cairo and is considered one of Egypt's most beautiful oases. Dakhla sits in a depression surrounded by pink cliffs. There are about 30,000 acres of cultivated land. Most of its 70,000 or so residents are farmers who constantly fight the battle of the dunes that threaten their fields and orchards. The fields and gardens are filled mostly with mulberry trees, date palms, figs and other citrus fruits. Dakhla has retained most of its culture and charm even though it has increased in size by about double and government funding and technical training has revitalized the economy. Dakhla is the only place in Egypt where new water wheels which are driven by buffaloes are constructed. They are made of palm timber and clay jars and are called saqiyas. The oasis is connected to Kharga by a 120 mile (200 km) road that has buses running daily. Research has found that the Oasis has been inhabited since prehistoric times, and that there was once a huge lake here. There are neolithic rock paintings that indicate that the lake was frequented by elephants, buffaloes and ostriches. As the lake dried up, the inhabitants migrated to the Nile valley and were probably some of its first settlers. Dakhla Oasis is dominated on its northern horizon by a wall of rose-Colored rock. Fertile cultivated areas growing rice, peanuts and fruit are dotted between sand dunes along the roads from Farafra and Kharga in this area of outstanding natural beauty. The capital, Mut, named after the ancient goddess of the Theban Triad, houses the Museum of the Inheritance, a traditional house, with an intricate wooden combination lock. Rooms, with sculpted clay figures, are arranged to show different aspects of Dakhlan culture and family life. Al-Kasr, about 35 km. 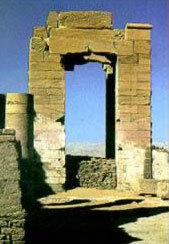 from Mut, was originally a Roman settlement which later became the medieval capital of Dakhla. The old town is a labyrinth of mud-walled alleys narrowly separating houses with elaborately- carved wooden lintels; there is also an Ayyubid mosque. Climb to the rooftop of the 10th century madrassa (school) for wonderful views of the surrounding area. Bir al-Gabel, a palm-fringed salt lake where you can camp and picnic, is on the road back to Mut. Other day trips from Mut could include the 1st-century al-Muzawaka tombs and Deir al Hagar, a temple which was originally dedicated to the Theban Triad and later rebuilt by the Romans. After exploring the temple, bathe in the hot sulphur spring nearby. Visit Bashendi to see Roman tombs and a factory where carpets are still woven with scenes of Dakhlan life. At nearby Balaat village, a trading post with ancient Nubia, archeologists are still uncovering dozens of 6th dynasty mastabas. Buses frorn the Al Azhar terminal, near Midan Ataba.